Luxurious Bay Harbor Resort private gated Community. Located high on a cliff offering spectacular views of Lake Michigan and Harbor Springs/Petoskey from three fully furnished decks. Unobstructed views of Lake Michigan. Summer or winter the sunsets are memorable! Gourmet kitchen fully appointed, dining area, and snack bar. Great room with gas fireplace, TV, DVD, and stereo - but why would you want to do anything but look at Lake Michigan and sip your favorite beverage. Gas grill on large deck off great room, dining table seating six and loveseat to watch sunrises and sunsets. Master suite with deep soaking tub and separate shower, doorwall to balcony overlooking Lake Michigan. Dormer bedroom with three full beds, two closets and TV/DVD. Third bedroom with queen-size sofa bed, TV, and balcony. Washer and dryer, attached garage, and private entrance. Professionally decorated. Indoor pool and hot tub within 200 feet of building. World-class Bay Harbor Golf Club, Boyne Mountain, Boyne Highlands and Nubs Nob within minutes. Shopping, restaurants, and entertainment on site. Minutes from beaches, downhill skiing, snowboarding, snowmobiling, and shopping. Many excellent public golf courses within 15 minutes. 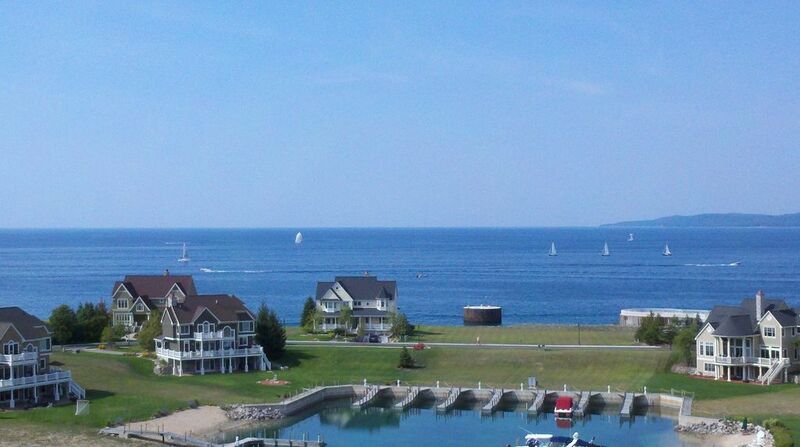 Charming Petoskey is three miles, Harbor Springs 12 miles and Charlevoix is 15 miles. Located in the private gated community of Bay Harbor, Michigan..., Northern Michigan's premier Golf, Boating & Skiing community. Golfers will love these Top 10 rated courses, Boaters will enjoy one of the top 10 ports in North America & Michigan's finest skiing is located within 15 minutes of the condo! In community restaurants include: Cava (fine dinng and live entertainment in the lounge), Knot just a bar (pub at the marina), Original Pancake House. Petoskey offers fine and casual dining options - check the sample menus in our kitchen! JUNE THROUGH SEPTEMBER ONE WEEK MINIMUM RENTAL!! Please note the maximum # of guests is 6 (that includes all children per fire code). My husband and I love to share our beautiful piece of paradise. We enjoy all 4 seasons from the deck overlooking Lake Michigan. Our travels take us away for long periods of time so we are willing to share our home, please make it yours while you are here. Bay Harbor offers a lifestyle that is unsurpassed in Northern Michigan - the Bay Harbor Marina, the fabulous yachts that moor there, the outstanding Bay Harbor golf course, the dining and the spectacular sunsets! The sunsets from the deck of are magnificient. The sailboats on the bay are picture perfect!! The beaches, hiking, biking, golf, and just relaxing make for a memorable vacation. Master bath - two sinks, separate 6' soaking tub and walk-in shower. Spectacular views of Little Traverse Bay, Lake Michigan. Fully equipped gourmet kitchen. Granite counters and stainless steel appliances. Snack bar seats 4 in kitchen/dining. (2) Private balcony off master bedroom and one off the guest bedroom. Deck overlooking Lake Michigan. Table for 6, loveseat and gas grill. Many exceptional courses within short drive, Bay Harbor and Crooked Tree within 2 minutes. Indoor pool and spa - 200' from front door! Great for skiing of cool summer evenings. DVD/VCR, No Smoking. No Trailers or boats at any time!! No pets - no exceptions. Please only 7 day minimum inquiries according to rate schedule. 3 day rentals only as outlined in rates in off seasons. Thank you for your cooperation.